This roasted vegetable nourish bowl is a quick and delicious meal. 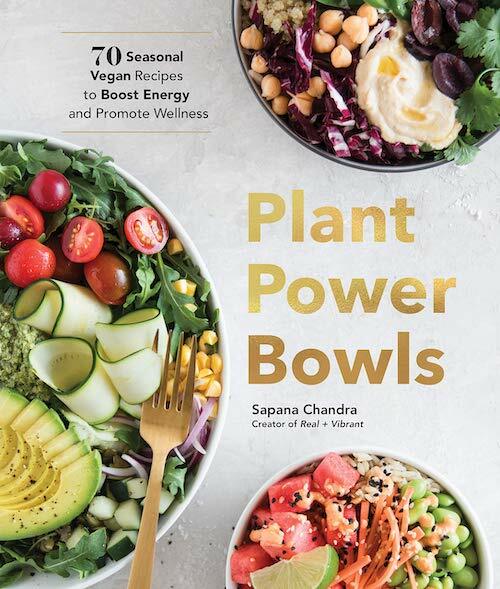 Packed with fresh and roasted vegetables, leafy greens, and healthy nourishing fats, not only will this power bowl fill you up, but also delight your taste buds. Although we’re wrapping up the third week of the new year, it’s still the beginning of the year in my books — a time for new beginnings and big changes, right? While any time of the year is a great time to set new goals and start working towards them, January is just a great month to do so. Every January, I would make a long list of promises or resolutions, “this year, I will……and…and…and….and” — you get the idea. The list was so long I would forget it by the second week of the year. Then, a few years ago, I decided to try something different. Instead of making a list of things I “should” be doing, I decided to dedicate a phrase or mantra to the year ahead. For example, last year’s phrase or motto was “Become the best version of myself.” The year before, when I became a certified yoga teacher, my goto phrase was “Do more yoga.” I felt like that one motto would guide me and lead to actions and give me an overarching goal to work towards. Did it work? Yes!! I still have a ton of work to do and goals to achieve, but I’ve done more in the last year than I ever imagined I could. I found this to be a much better than any other technique I’ve ever tried before. So what’s my phrase for this year? It’s one of my favorite quotes by Susan Jeffers (and the title of her book): “Feel the fear, and do it anyway.” As a new business owner, I want to embrace this way of thinking this year. I’ve been guilty (many times) of allowing my fears to hold me back, but this year I want to make an effort to recognize in myself 1) when I’m acting out of fear and 2) take action despite of the fear I’m feeling. I’d love to hear what’s motivating you all this year? Is it a set of resolutions? If so, how are they coming along? Or maybe you’re the anti-resolutions person. While I believe anytime of the year is a great time to set new goals and start working towards them, January is just a great month to do so — the perfect time to just wipe the slate clean. Sticking to my healthy habits that I’ve developed over the years will always be an important part of my year. If you’ve been following me on Instagram recently, you’ve probably noticed I’ve been posting a lot of salads and bowls. As a former salad hater, it was only a few years ago that I realized just how delicious salads can be. And there’s just so much room for creativity — they’re a great way to pack in a few servings of vegetables. And they definitely don’t need to be boring, actually, quite far from it. Nourish bowls can be such a comforting and delicious meal, packed with so much goodness. You can always roast your vegetables in advance so that you’re not spending time with the oven. As for this nourishing bowl, you’re going to love this. This bowl is such a comforting and delicious meal, packed with so much goodness. 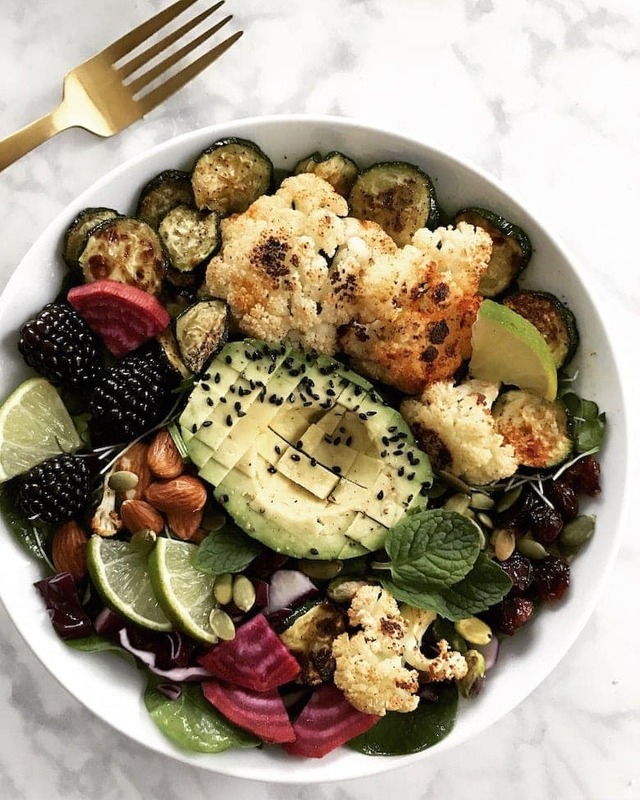 The roasted cauliflower and zucchini pair very well with the avocado (but then again, what doesn’t taste great with avocado)? You can always roast your vegetables in advance so that you’re not spending time with the oven. As always, if you try this recipe, I’d love to hear what you think! Just tag your photos to #realandvibrant on Instagram. There’s truly nothing that inspires me more than seeing you guys trying out the recipes I post. Have a beautiful weekend! A quick and delicious meal packed with fresh and roasted vegetables, leafy greens, and healthy nourishing fats. Preheat the oven to 425F. Line a baking sheet with parchment paper. Spread the cauliflower florets and zucchini slices in a single layer. If you like to roast your beets, add those as well. Drizzle with coconut oil, paprika, sea salt, and black pepper. Roast the vegetables for 30 minutes (longer if you like them extra roasted and crispy). While the veggies are roasted, prepare the remaining ingredients. Add the spinach and top with avocado, cabbage, blackberries, and green onions. Sprinkle with pepita, almonds, and sesame seeds. Once the roasted vegetables are done roasting, add them to the bowl. Drizzle with lime juice and adjust salt and pepper. Enjoy!